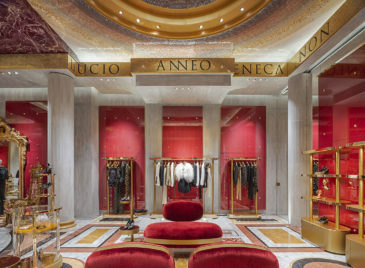 Located at the base of the Spanish Steps within Rome’s distinguished Piazza di Spagna stands the 800 square-meter, two level luxury boutique for the archetypal Italian fashion house Dolce & Gabbana. 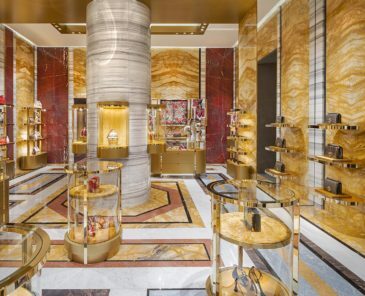 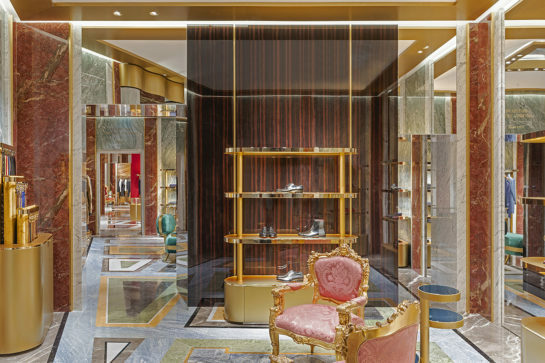 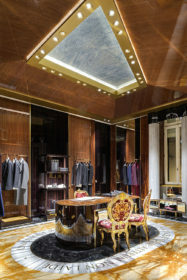 The store’s design is an insightful and beautifully impressive contemporary interpretation inspired by the shared identity of the Brand and the city’s rich traditions of culture, power, craftsmanship and the Italian baroque. 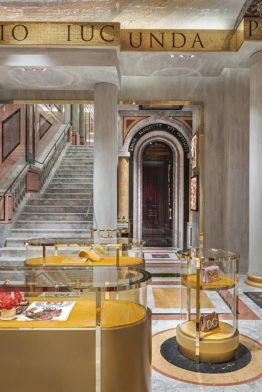 Upon entering, to inaugurate the experience Eric employs the Baroque technique of “forced perspective”, a magical illusion that distorts the perception of depth, inspired, by Francesco Borromini’s colonnade at the Palazzo Spada. 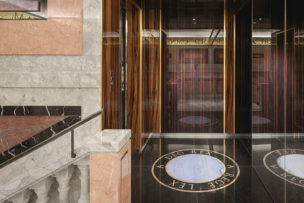 Three contiguous spaces decrease proportionally in size, ceiling heights, column proportions, and floor patterns to create the magical illusion of depth. 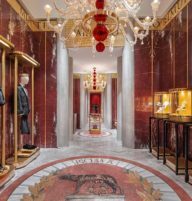 Even the dazzling red and gold hand-blown Murano glass chandeliers were custom designed in 3 different scales to accentuate the effect. 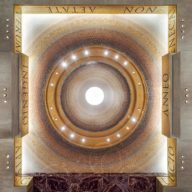 From the entry space visitors are drawn into the GRAND ROOM, 22 meters long with a 6 meter high ceiling that’ capped with two skylight domes, each lined in gradating colored rings of handmade stone mosaics. 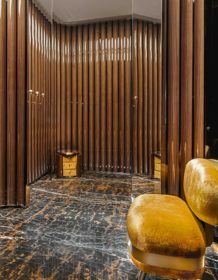 The walls of this “Vatican-scaled” space are raw concrete punctuated with glass covered moiré silk panels in a luminous cardinal-red. 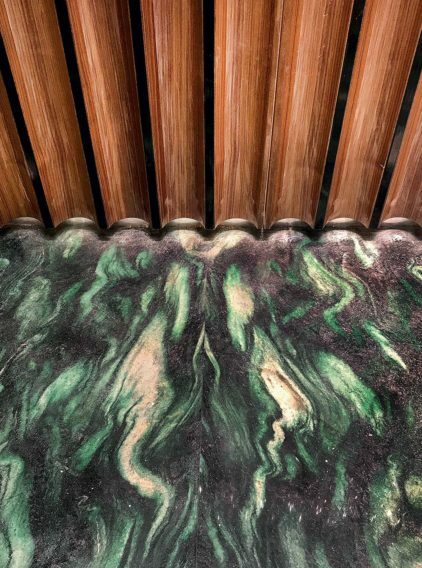 The stone floor is masterpiece of Italian craftsmanship. 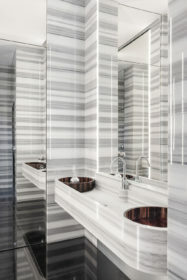 15 different marbles are geometrically collaged in a range in colors from intense yellows, reds, ivory and creams, blue quartz, mother-of-pearl whites and intensely veined blacks and greys. 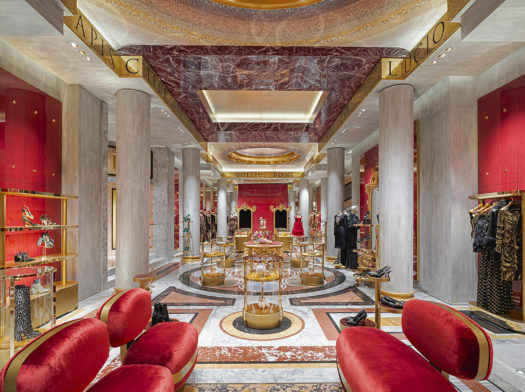 Rome is a BAROQUE CITY containing vital and lavish creations with a hyper-reality that deform and exaggerate perceptions to astonish and inspire. 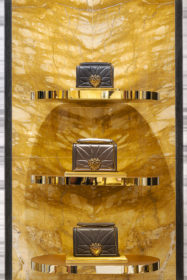 A stunning example of this is the “DIGITAL GALLERY”. 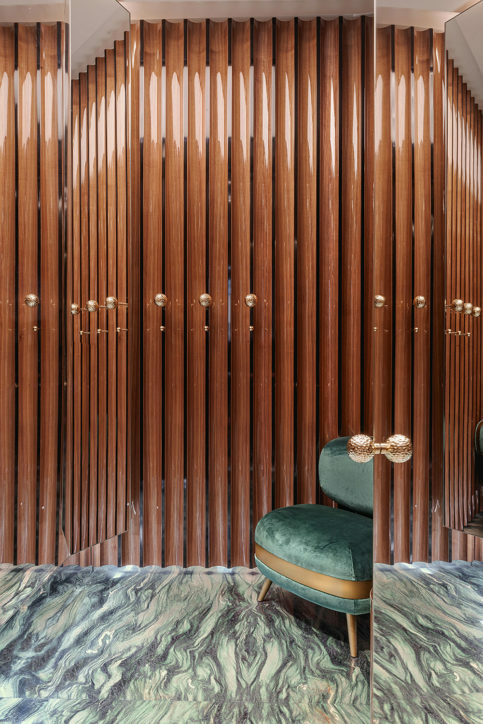 Inspired by the Vatican’s Sistine Chapel and Gallery of Map. 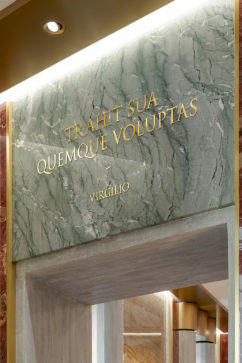 After climbing the grand marble staircase visitors discover a linear gallery transporting them into a heavenly paradise. 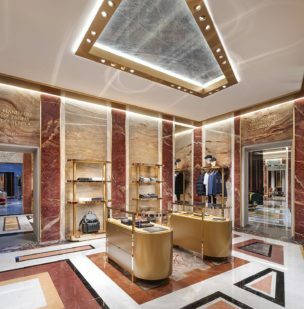 In a contemporary baroque architectural maneuver the linear half-vaulted space is made magically whole by its reflection within a full-length mirror wall visually completing the vaulted form. 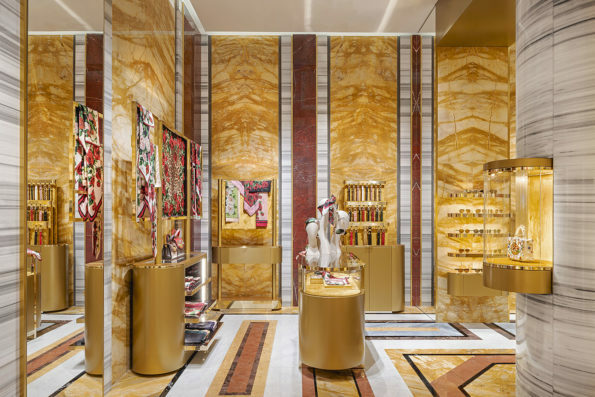 The modern baroque gesture is brought to its culmination by digitally transforming Paul Troger’s 18th century ceiling fresco. 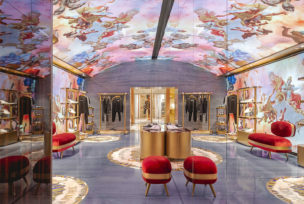 Through curved LED ceiling and wall screens Hercules and Athena are brought to life engulfed in billowing dark clouds of thunder and lightening that slowly give way to a rising sun while surrounded by the penetrating vibrations of Gregorian Chants.